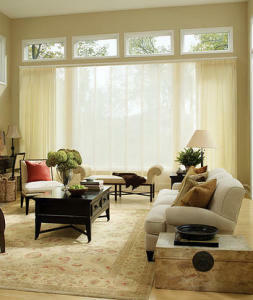 The Skyline® Gliding Window Panels are a patented twist on vertical blinds. A sleek, contemporary design lends drama to any décor, whether covering large windows or when used as a unique room divider. Featuring available PowerView® Motorization – a motorized operating system that allows you to easily open and close your window fashions with the touch of a button.Controlling your window treatments with a mobile device means you can set your blinds to movie mode, work mode, or 8 a.m. mode with the touch of a button, without leaving your seat. It’s effortless, fun and smart—with perfectly smooth operation.